1. Grind small onions, garlic, buah keras, lemon grass, turmeric root, lengkuas, blachan to a paste. Then add in chilli paste and mix well. 2. Heat ¾ rice bowl of oil to a wok. Fry the rempah until fragrant. Stir in the salt and sugar on low heat. Remove from heat and leave to cool. 3. Beat 2 eggs into the fish paste in a big bowl and stir until smooth. Add in laksa leaves, between 400g to 600g of fried rempah and coconut milk and stir until texture is smooth. Pour into a greased baking tray and bake in a moderately hot oven (abt 180C or 190C) for about 20-25 minutes. 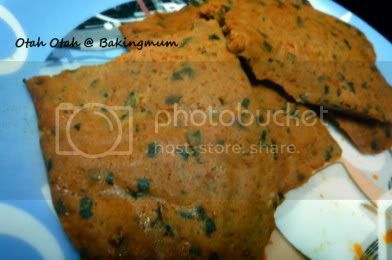 Otah is cooked when it shrinks from the side of the baking tray. Remove from heat and leave to cool. Hi Ohbin, I don't know how Muar and Penang Otak taste like. But the person who gave me this recipe told me it's her mother-in-law's nonya recipe. Hi! Your otak looks so yummy and I would really like to try this weekend. May I know what sort of chilli paste should I use and where can I buy them? Many Thanks!